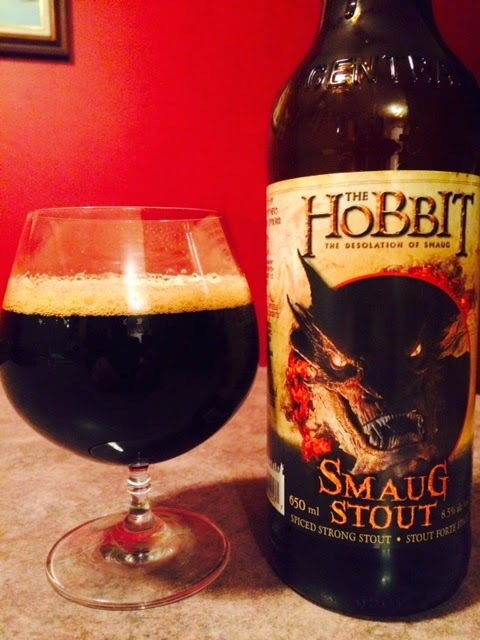 Smaug Stout comes compliments of Central City Brewing in Surrey, BC, Canada. One thing that caught my attention was that this stout is brewed with chili peppers, the unique taste of which was beautifully evident in the first sip. And seeing as how this stout is named after a fire-breathing dragon, and chili peppers are also often associated with fire-hot foods, it's an ingredient that, odd as it sounds, works. I, for one, enjoyed this stout and will undoubtedly look for it again. "After escaping capture by the dangerous Woodland Elves, the Dwarves journey to Laketown, and finally to the Lonely Mountain itself, where they must face the greatest danger of all - a creature more terrifying than any before, which will test not only the depth of their courage, but the limits of their friendship and the wisdom of the journey itself - the Dragon Smaug." And just for fun, here's the official teaser trailer and inspiration for this beautiful stout. Enjoy.